Manchester Electric - a new network of charge points and Pod Centres - is set to be launched across Greater Manchester this autumn. The Manchester Electric Car Company (MECC) together with its partners will launch the first of 300 charge points and six larger Pod Centres to encourage electric car use in and around the city. Manchester Electric will be a new network of state-of-the-art Pod Centres where people can buy a range of electric vehicles including cars, vans, scooters and bikes. There will also be centres where drivers can lease, hire and charge EVs, as well as being able to join an electric car club, shop or buy a coffee. Domestic appliances – also known as smart charging systems – that will enable drivers to charge their vehicles at home will also be available. The Pod Centres will be in key sites including Manchester Airport, Manchester City Centre, Oldham, MediaCityUK, Stockport and the Trafford Centre, with more to follow. MECC’s medium term plan is for around 25 Pod Centres across greater Manchester. 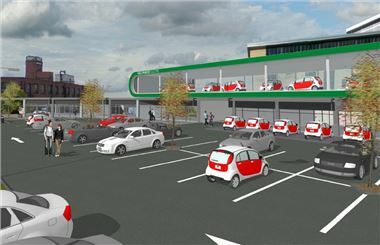 Staff in the Pod Centres will be on hand to educate drivers about EVs as well as offering vehicle sales and hire, after sales care and retail facilities. In addition there will be around 300 charge points across Greater Manchester where commuters can charge EVs through fast and rapid points. As a guide, a fast charge point (32amp) charges a vehicle in two - three hours and a rapid charge point takes around 30 minutes. The programme to establish the network of charging points will be delivered over a two-year period. A consortium from Greater Manchester, led by the Association of Greater Manchester Authorities (AGMA) secured £3.6million of support through the Government funded ‘Plugged In Places’ scheme. This has been match funded by a private consortium led by MECC, a new private sector company, which will manage and deliver Manchester Electric along with its partners. MECC will help to accelerate the move of electric cars to mass market and provide users with all the information they need through the Pod Centres. The scheme is sponsored by AGMA and the Greater Manchester Environment Commission. MECC is working closely with AGMA to look at how the scheme will fit with public transport. A smart card is currently being developed which drivers will use to be able to access the charging points. It will also be an Oyster-style card that will be interoperable on public transport and EVs. Electric vehicles have fewer moving parts than motor vehicles and don’t have exhaust pipes, engine oil, head gasket or spark plugs – making them cheaper to maintain. EV owners will not have to pay road tax or congestion charges. Charging an electric vehicle is also much cheaper and far more economical to run than a fossil fuel run motor vehicle.